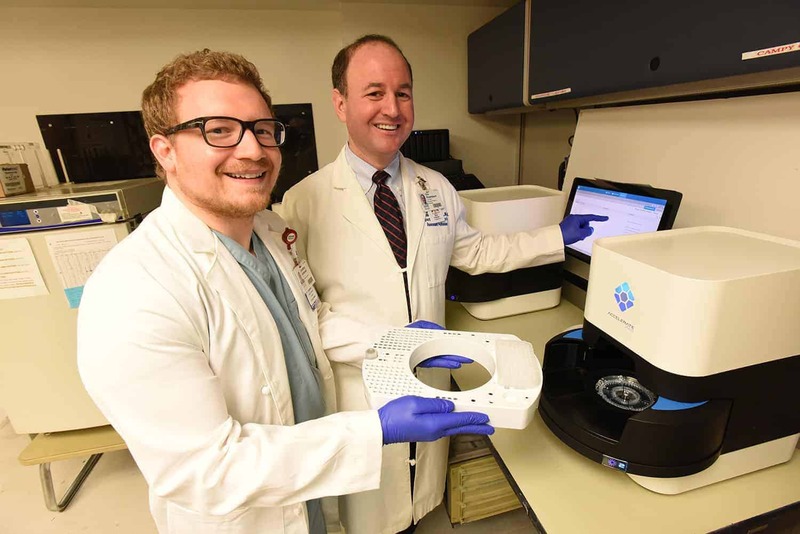 Eric Rosenbaum, M.D., M.P.H., (right) shows the Accelerate Pheno to resident Jonathon Gralewski, D.O., in the UAMS Clinical Microbiology Laboratory. The Accelerate Pheno identifies pathogens associated with blood-borne infections and the antibiotics most effective against them. Feb. 21, 2018 | Feb. 21, 2018 | A new technology at the University of Arkansas for Medical Sciences (UAMS) reduces from days to hours the time it takes to identify pathogens associated with life-threatening blood-borne infections. The FDA-approved Accelerate Pheno(TM) system also quickly identifies which antibiotic would be most effective on a case-by-case basis. It is the latest addition to the Clinical Microbiology Laboratory’s array of industry-redefining technologies for the identification and treatment of infectious diseases. Conventional methodology takes at least two days to identify a pathogen and about three days for the antibiotic results. The Accelerate Pheno can identify a pathogen in one hour and identify a treatment in a matter of several hours. “For critically ill patients with blood infections, hours compared to days can save lives – this marks a major change in the way UAMS now approaches these complex illnesses,” Rosenbaum said. Most significant is the ability of the Accelerate Pheno to test a pathogen’s susceptibility to various antibiotics and provide a score indicating which antibiotic would be most effective. The Accelerate Pheno is an example of how innovators and tech-minded individuals are changing the world of medicine. Previously, the method of testing samples had remained essentially unchanged since its inception decades ago. It involved putting a sample from the patient in a dish, allowing it to grow, and then identifying the pathogen using relatively prolonged biochemical testing. Instead, the Accelerate Pheno uses a technology called morphokinetic cellular analysis. Video of a pathogen’s growth is recorded and computer algorithms compare it to an archive of growth pattern information – a first-ever application of this technique in clinical microbiology. The Accelerate Pheno is just one of several technologies at the Clinical Microbiology Laboratory that improve identification of diseases, including tuberculosis, meningitis, drug-resistant infections, influenza and others.